A deciduous tree, bushy when old, with toothed, lance-shaped leaves, rose-coloured or almost white flowers, solitary or paired, the fruit a hard, green drupe enclosing the smooth stone containing the edible seed. To 8m. [RHSD, Hortus, Hilliers']. The almond is a native to the Middle East and Asia as far as the Indus. It was spread by humans in ancient times along the shores of the Mediterranean into northern Africa and southern Europe and more recently transported to the New World. The wild form of domesticated almond grows in parts of the Levant and almonds were probably first cultivated in this region. The fruit of the wild forms contains the glycoside amygdalin which is converted into prussic acid on exposure to air. However, domesticated almonds are not toxic. It seems that a common genetic mutation causes an absence of amygdalin, and this mutant was exploited by early farmers, albeit accidentally. Almonds were one of the earliest domesticated fruit trees. The species is not easily propagated from suckers or cuttings, and, as with peaches, the ability to raise useful almonds from seed would have assisted early domestication. Domesticated almonds appear in the Early Bronze Age (3000–2000 BC) of the Near East, or possibly a little earlier. A well-known archaeological example of the almond is the fruit found in Tutankhamun’s tomb in Egypt (c.1325 BC), probably imported from the Levant. [Adapted from Wikipedia and other internet resources]. Cultivated in England since the 16th century or earlier. The illustration used here is from Saint-Hilaire’s Traite des Arbrisseaux et des Arbustes Cultivees en France et en Pleine Terre [Saint-Hilaire Tr. 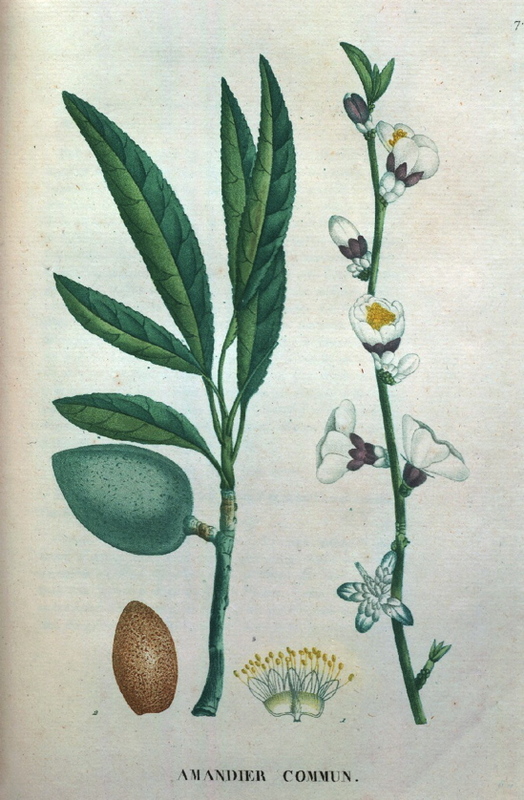 vol.1, pl.7/1825] It depicts the common almond, showing leaves, flowers, fruit and seed. Almonds are often grown for their attractive flowers but I have found no evidence of this at Camden Park. Amygdalus communis is marked with a ‘c’ in an 1836 edition of Loddiges’ catalogue held at Camden Park [CPA]. In William Macarthur’s code, used and explained elsewhere, this means grown at Camden. It is almost certain that it was grown in the gardens around this time and probably much earlier. Two varieties of almonds, ‘Jordon’ and ‘Paper-Shell’, are listed in all published catalogues under Plants Bearing Fruit. These are described separately.